If the plan for Shamrock Rovers in 2017 was to bridge the gap between themselves and the top two of Cork City and Dundalk, then the strategy is not working as Rovers, losing 2-1 at home to Cork, already look off the pace. And while they may have deserved at least a draw from this defeat - their third loss in five games to date - even Rovers boss Stephen Bradley admits that his side cannot afford keep making errors, basic ones, in key games and expect to progress. 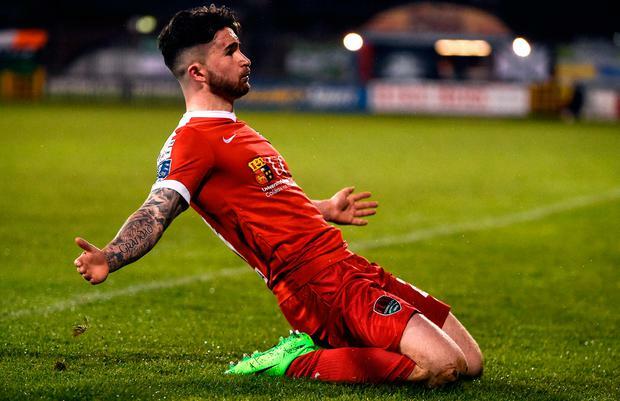 Sean Maguire scored both goal for Cork and one could argue that both were handed to him, instead of created from nothing by sheer genius. A dreadful mistake by Rovers keeper Tomer Chencinski early on gifted Maguire his opening goal while six minutes from time the striker was central again, winning a penalty after a foul in the box by defender Dave Webster with Maguire stepping up to score from the spot. "It's frustrating," said Bradley. "You look at the second half, we got into them, we pinned them in, we battered them, hit the crossbar, we were much the better team - and two silly mistakes costs us the game. It's very frustrating." The Rovers players protested the awarding of the ­penalty, claiming that ­Maguire had dived, but a candid Bradley felt that was missing the point. "It doesn't matter if he dived, or not dived, we shouldn't make the tackle. We're very naive to make that tackle in the box where a forward, every forward, is going to go down. It's silly. "If you stop him [Maguire], you stop them. We defended him really well as he didn't do anything all game. But you can't switch off for two seconds because he's a good player and Tomer switches off and we got punished." Rovers have struggled with keepers since the departure of Alan Mannus in 2011, and there were fresh question marks over their current No1 early on when he gifted Cork their lead goal. Canadian international Chencinski appeared to be under little pressure to deal with a headed back-pass from Danny Devine but he somehow lost possession to Maguire, and the poacher supreme doesn't waste those chances as he scored for the fifth league game in a row. Despite the lead, City seemed to go into their shell as Rovers dominated possession, though Cork almost made it 2-0 with a well-struck free kick from Kevin O'Connor. It was a lapse of another kind which got Rovers level on 39 minutes. Darren Meenan whipped in a ball from the right, Conor McCormack - an ex-Rovers player - handled in the area and referee Jim McKell pointed to the spot. Keeper Mark McNulty got a touch to Burke's spot-kick but not enough to keep it out. Rovers were the better side in the second half but were unable to carve out a goal and as a 1-1 draw loomed, Webster made that challenge on ­Maguire for the penalty.